Besides rapper Psy, Super Junior's Siwon also attended the famous Met Gala in New York City together with other Korean stars. In an interview with Billboard.com before the gala, Siwon said he couldn't believe it that he was going to attend the event. "I can't believe it. Last year, I attended the gala at LACMA. I saw Tom Hanks and Jack Nicholson. I felt like I was watching a movie. I just can’t believe it. I’m very honored and very proud,” he said. Siwon posted a photo of himself in a suit at the Met Gala on Twitter. Siwon has 3.49 million fans on Twitter, becoming the No. 1 Korean celebrity with the most number of followers. He said in fashion, the most important to him are confidence and expressing one's self. "The most important parts of fashion to me are confidence and expressing who I am. If I have those things in anything I'm wearing, then I can be more comfortable. Fashion is confidence from me. If I’m comfortable in everything I'm wearing, then I can do better," he told Billboard.com. After the Met Gala, Siwon immediately left New York City to fly to Singapore. There he attended the Chanel Cruise collection fashion show presented by the brand's head designer Karl Lagerfeld held at the Loewen Cluster. 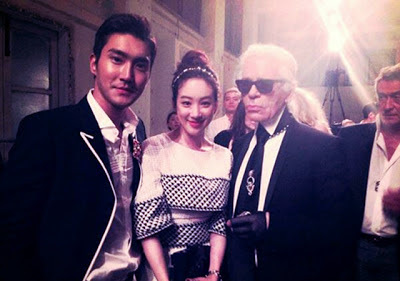 Besides Siwon, other stars who attended the fashion show were Dakota Fanning, Korean actress Jung Ryeo Won, Chinese actress Gwei Lun-Mei and Zhou Xun and Singapore's Fann Wong and Kit Chan. Last year, Lagerfeld took photos of Siwon for VMAN magazine. Siwon told VMAN he was impressed with Lagerfeld. "I was impressed with his comfort, friendliness, and caring heart," Siwon said. In the interview with Billboard.com, Siwon talked about Super Junior's Super Show 5 tour in South America. "South America was amazing, very powerful. We didn't imagine they like K-pop there and they loved it! The fans always make amazing moments for us. I just have to mention how appreciative I am." Siwon thanked fans for their support. "I just want to say, always thank you. Now, it's not that Super Junior and I are singers or actors for the fans. We're family. I'm so appreciative for all the good memories and teaching us true love," he said.